Her knowledge is encyclopaedic and she’s one of the most clued up women we know. Introducing Kristie Dash. Everyone has that one friend who knows everyone and everything. You know, the one who could tell you the best place to go for an eyebrow wax as easily as they can rattle off a list of the hottest new restaurant openings everyone’s trying to get a reservation for. In beauty terms, Kristie Dash is your girl. 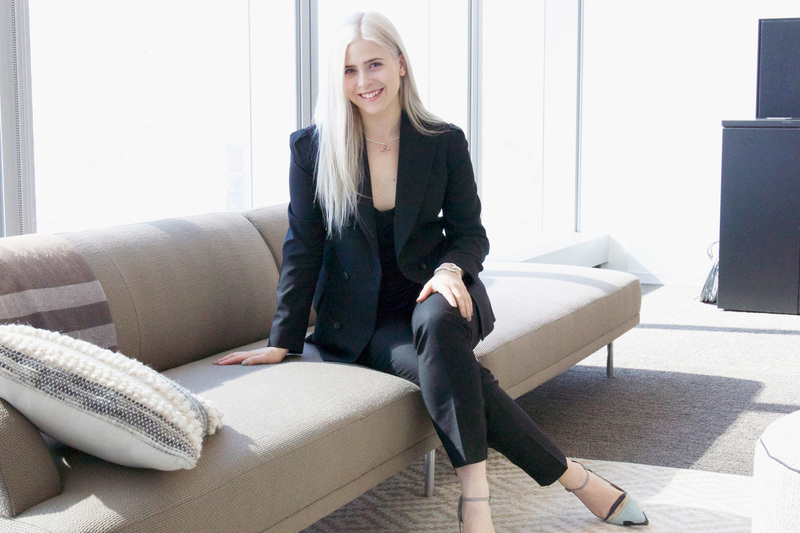 As the online beauty editor at Allure, it’s her job to scope out, trial and write about every and everything there is to know about beauty. Now, it may seem impossible that just one person could have a handle on every new launch, every hero product, and beauty hack from those in the know. The thing is, she really knows what she’s talking about. Over the years she’s made us laugh out loud with her candid accounts of lying in a pitch-black salt water tank or wearing Kylie Jenner’s acrylic nails for a week, not to mention teaching us everything we know about how to go into nail rehab after said acrylic nails and the trials and tribulations of getting full body laser hair removal (her conclusion: do it). When we meet at Allure HQ, she’s busy. It’s the height of fashion week and, as well as her usual writing schedule, she’s on call backstage reporting on the new season trends and hero products from the front line. Despite the frantic pace, she radiates a warm energy in a way that makes it hard not to be instantly taken by her. Nestling beside me on a sofa in their open plan office, it feels more like sitting down for a gossip than an interview. 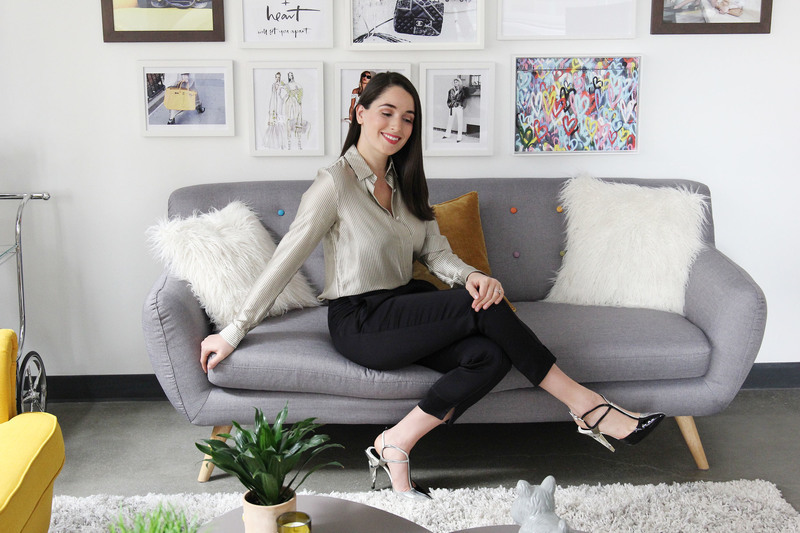 There’s no doubt about it, she’s fun – just follow her on Snapchat and Instagram and you’ll see – but when it comes to work, she’s straightforward, professional and focused; qualities that have made her name shoot up the masthead. Her playful side comes out in her writing. Primarily, I write for the website, but I also work on social-first content and video. I was just recently promoted, so I haven’t had a chance to prove myself yet, but I’m really excited about working on these types of digital projects because I think they add personality to a brand. Traditionally, brands use social to direct followers to their websites, but what about rich editorial content that’s specifically tailored to each platform? That’s the stuff I would love as a user and though numbers-wise it will be an experiment, I think it’s important and worth it in the long run. Apart from all of that, I still get to do some writing for the magazine, which I love because, in comparison to writing for web, you can pour over each and every word until even the tiniest box of text is perfect and elegant. For digital, you don’t have as much time, but it’s fun to be able to quickly pick up on a news story or a tip you heard from a makeup artist and have it published there and then. It’s also my responsibility to be clued up on the beauty market, which can be daunting since it’s so big, but I love the fact that involves testing every product out there! I manage Allure’s Snapchat (alluremag) too, which is great for me because I’m obsessed with Snapchat generally. I don’t think of it as a social media platform, but as a place to share stories from an unedited, real point of view. I’m convinced Snapchat is the new television. Digital is constantly evolving and it’s definitely intimidating, but to me, it’s thrilling. Being able to adapt is key, even if it’s not comfortable. I don’t want to be comfortable! I’d say that anyone who wants to have a “comfortable” career should probably not work in media right now (laughs). I stay inspired and informed by reading as much as I possibly can. As the ultimate consumer, I can think about what I love to see and read and what’s missing. That’s my job: to find gaps and fill them with cool content. It’s a fun challenge. It sounds crazy but by the time I was thirteen, I knew I was going to move to New York. Not to be an editor, but to be a dancer. There was no other option: just dancing, singing, acting — the whole thing. I always enjoyed my English and writing classes in high school, but it was dance that kept me focused. If I didn’t have good grades, I couldn’t go to dance. So I got all As. When it was time to choose a college, I had two plans: either get into one of the five dream schools for musical theatre or go to a college in New York City for English or communications so I could start auditioning. Long story short, I hadn’t heard from my top choice, Boston Conservatory, until after I had my mind set on studying communications Pace University right here in Manhattan. They gave me a great scholarship and I got really excited about starting the city life I always wanted (keep in mind, I’m from a little bubble of a suburb outside of Pittsburgh). When I found out I was accepted into Boston’s BFA program, I just kind of remember being relieved and overjoyed but also conflicted. My hard work paid off since this was my goal, but tuition was high and it just didn’t feel right. Looking back, choosing Pace was probably the most life-changing decision I’ve made. During my first semester, I went to classes and then to auditions. I did any random gig I could get—the most exciting one was probably the time I was an extra on Gossip Girl. But I quickly realised I was kind of miserable. The whole “struggling artist” thing is real. Going to daylong auditions only to be turned down based on your appearance was annoying to me. Not because my feelings were hurt—dancers are trained to be emotionally unaffected by this sort of thing—but because I wanted to do work I was passionate about and not have to be a waitress. I wasn’t willing to live that lifestyle and I could tell it would be too much of a struggle. I’m grateful that I made this realization quite soon into my freshman year so I was able to start trying out literally anything I thought could be a good fit. I applied to probably 20 different internships (in television, fashion, music, and journalism) for my second semester. They were mostly just companies I thought sounded cool and fun to work at, to be honest like NBC and MTV. The writing-based roles were the ones I hoped to get replies from because writing was my academic strength, so I guess that’s when I first thought about working at a magazine. I had no clue what that really meant, though. My first placement was at Harper’s Bazaar. I applied through my school’s career services program but I also submitted an application on Hearst’s website. That was the one that somehow got noticed. When I went in for an interview, I realised that the thing they were most interested in was this one little line I had on my resume about packing trunks with a stylist. I probably exaggerated the project—I literally only helped her for one day—but it was exactly what I’d be doing in the fashion closet and it was enough for them. It was an amazing first internship to have because it was like a crash course in the industry, and I met a ton of people I’m still friends with today. I did two placements in my sophomore year: one at Celebuzz.com and the other at NBC’s Peacock Productions. It wasn’t easy but I just kind of got it done. You know that cliché interview question about your biggest strength and biggest weakness? I guess my biggest strength is my work ethic and I got that from my family and my dancing days. I don’t understand people who make excuses. I had early morning and late night classes—every hour was scheduled, which I hear is very much the opposite of a traditional college experience. I ended up at Teen Vogue because I loved the brand and was convinced I’d be the perfect fit so I fired off emails to half the people on the masthead. Thinking about it now is so embarrassing. I had no connection to any of them, but I sent well-written cover letters and had the resume and writing portfolio to back it up. I ended up getting two interviews—one with web and one with beauty—and they ended up making a combined web-focused beauty internship for me. It was an incredible experience and it showed me that I wanted to work in beauty. Eva Chen was my main supervisor, since she was the beauty director at the time, and we connected. 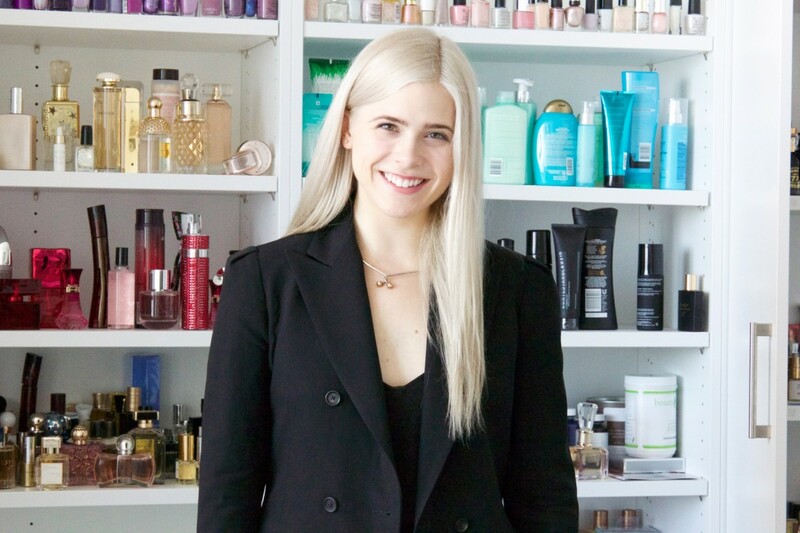 She helped me get a similar position at Vogue, under Sarah Brown, which further solidified the fact that I wanted to be a beauty editor and work at a magazine after graduation. I became kind of obsessed, actually. While I was studying abroad during my final summer in college, Eva was brought on to consult at Lucky. I had stayed in touch with her after Teen Vogue and through my time at Vogue, so I sent her some sort of congratulatory email. In reply, she asked me about my graduation date. I still had one semester left (I was a semester ahead because of AP classes in high school) but I basically said I could start working immediately if there was an opportunity, hoping that this was what she was implying. A month later she was named editor in chief and she asked me to be her assistant. I was able to arrange the remainder of my classes to be online, since they were mostly electives, and I just kind of made it work. To this day, I’m convinced that those first four months of doing both school and a very intense, full-time job will be the hardest yet most rewarding four months of my life until I give birth. I felt like I was drowning and I know I wasn’t doing my best in any arena, but when I graduated it got a lot better! Digital is constantly evolving and it’s definitely intimidating, but to me, it’s thrilling. Being able to adapt is key, even if it’s not comfortable. I don’t want to be comfortable! I’d say that anyone who wants to have a “comfortable” career should probably not work in media right now (laughs). Apart from being the liaison between Eva and the editors, my primary responsibility was her calendar and you can’t even imagine how insane it was—especially since she was new to the role, as well. Literally, every fifteen minutes were scheduled and if one person was late or if some kind of fashion crisis went down, the whole thing would have to be rejiggered and I’d have to contact every person in every one of those meetings. That required most of my attention, but that also meant I was in constant conversation with every single staff member so I learned everything there is to know about how a magazine is run. Also, I went with Eva to a lot of her television interviews, events, panels, and such. They were always really fun and inspiring. Not many assistants get to be in the same room as Karl Lagerfeld and Riccardo Tisci but she always brought me and I’m so grateful for those incredible memories. She’s so low key so I never had to do anything crazy for her. Actually she had a crazy coffee order but that was it (laughs)! I wore and applied my own makeup from a young age as a dancer, so there was always that connection, but I find it to encompass a lot more than fashion does and that is satisfying as a writer. Skin care, makeup, hair, fitness, nutrition, wellness and scientific breakthroughs like injectables, injestibles are just some of the things that come under the beauty umbrella. There’s so much to talk about! With that being said, I love fashion and for a hot second at Lucky, I became obsessed with accessories and secretly wanted to be an accessories editor. I wish I had a clone so I could do both. Even when I wash my hair, I don’t actually cleanse my face with anything other than water. Since I thoroughly scrubbed seven hours beforehand, I find morning cleansing to be too drying for my combination skin. No matter what, though, I use a serum, eye cream, and a face cream that usually has SPF in it. The brands constantly change, but all-time favourites for each category are Chanel Hydra Beauty Serum (light but hydrating), Sunday Riley Start Over Active Eye Cream (soothing and comes in a convenient pump), and Lancôme Rénergie Lift Multi-Action Cream with SPF 15 (like a luxe moisturiser but with SPF benefits). I sometimes add a serum with vitamin C and E (SkinCeuticals and Dermadoctor have great ones) because I have such pale skin and need all the help I can get to fight free radicals and brighten spots. I’m bad about the skin on my body. Actually that’s my New Years resolution—to take better care of the skin on my body. I’ve been neglecting it and I know I’ll regret it in ten years. I have this jar of Chanel body cream that I use on special occasions. Also, Kenzo skincare has a body cream that smells delightful. No matter how many studies show fragranced skin care is drying, I don’t care—I love a good fragrance. At night, I take off my make-up with a wipe. Not all wipes are created equally but I feel like I go through them so fast, I use whatever is on hand. I’m currently using the E.L.F. Cosmetics ones and I’m really happy with them because they truly take all my makeup off. After cleansing with Acure Pore Minimizing Facial Scrub, I use Radical Skincare Age Defying Exfoliating Pads, SK-II Ultimate Revival Serum, the Sunday Riley Eye Cream I use in the morning, and a face cream like Shiseido Bio-Advanced Super Restoring Cream. Oh and always Blistex Lip Medex lip balm. I’ve always kind of had a knack for applying make-up. It was fun because I got to be really experimental at a young age thanks to dance. I’ll never forget the one look we did for multiple performances that involved thick white eyeliner in the corners of the eyes and dark brown lipstick. I was ten, probably. Of course my mom helped me at first, but I’m so OCD-particular that it didn’t take long for me to start doing it myself. Nowadays, I’m boring and stick with the exact same beauty look every day. I’m the same way when it comes to fashion and hair, too. I have a uniform and makeup is a part of that. Every day is the same. A full face of MAC Pro Longwear Nourishing Waterproof Foundation, a little brownish bronze eyeshadow like the Nars Dual Intensity Eyeshadow in Himalia, the Kat Von D Tattoo Liner, tons of Chanel Le Volume de Chanel Mascara, defined brows courtesy of Burberry’s incredible brow pencils and a natural berry lip colour. I switch it up but I love the shades at Armani and Tarte. Oh, and I always have touches of Nars Contour Blush and Benefit’s Watt’s Up Highlighter. At night, I usually do an exaggerated version of my daily routine, but if I’m going for drama, I’ll do an eye over a lip. Lips never stay put and I don’t want to have to think about them. Smudgy eyes are sexier than smeared lips, no? I have an unhealthy attachment to my long hair. It’s always been long and I will never cut it. I think it’s a dance thing because you had to wrap it up into complex buns. Remember that Glee episode about “Hairography?” That’s a thing. I’m weirdly a control freak about the shape of my nails and I never have time to go to the salon so I usually do them myself. My strange routine involves painting them right before I go to bed on Sunday nights. I’ll watch TV and then fall asleep with my hands perfectly dangled over my bed and pillows. Can you believe I’m single?! I tend to get gels before fashion week or holidays, though. My nail colours are pretty predictable: it’s either dark pinot noir red, muted grey, dusty purple or teal. The only bright colour I find acceptable is royal blue. I don’t know why. Deborah Lippmann and Nails Inc are my go-to brands because I gravitate towards their shades and their brushes work well for the shape of my nail bed. Sally Hansen Miracle Gel Topcoat is amazing, too. I bleach my hair so if I washed it every day, it would be way too weak. The problem is that, because it’s fine, straight, and light, my roots can’t hide grease. Washing it every other day is the best I can do. If I have a weekend with minimal social obligations, I’ll try not to wash it and just use Klorane Dry Shampoo with Oat Milk. As for shampoo and conditioner, my favourites are from Redken’s Frizz Dismiss line because they are extremely moisturizing. Every other wash, I’ll use a purple shampoo to tone out brassiness. Clairol Shimmer Lights is by far the strongest one and I like that because I like being a bit ashy. I feel like I’m an unofficial spokeswoman for Shu Uemura Essence Absolue because I tell everyone and their mother about it, but it’s the best, especially for dry, processed hair. It’s a leave-in oil that soaks right into your ends and makes them feel smooth even if they’re split. The formula acts as a heat protectant but I also love using it on days I’m air-drying because it helps my long hair from looking frizzy. I was blonde as a kid so when it started growing out at age 12, I got highlights. Ever since, I’ve been going consistently blonder until I finally got a double process last year. It wasn’t that hard to do because I was already so blonde. Every other month, on the dot, I realise my roots look bad and so I’ll see Aura Friedman at Sally Hershberger Salon—she’s a genius. My hair is naturally very straight and doesn’t hold curl so in the evening I embrace it and stick with what works. I usually flat iron the ends so it’s extra sleek looking, especially at night, but you’ll rarely see me in any other style, texture, or even part. I have an unhealthy attachment to my long hair. It’s always been long and I will never cut it. I think it’s a dance thing because you had to wrap it up into complex buns. Also, remember that Glee episode about “Hairography?” That’s a thing. I keep it healthy by investing in the products I use on it, but I’m admittedly bad about getting trims. The biggest trends I’m excited about right now are cushion compacts and colour correctors. So many brands are coming out with them and they’re so different from what’s traditionally out there. It’s refreshing. Glossier isn’t under the radar anymore but they are definitely in a league of their own until someone else can master what Emily and her team have done. It’s inspiring. Otherwise, I’m excited about this nail polish brand called GUiSHEM that has amazing packaging, and this fragrance brand called Roads. I’m bad at switching off because I genuinely enjoy what I do and I like to feel connected. And I rarely find “me” time during the week, so weekends are indulgent in every way. I’d like to find some balance but it’s a struggle and I’m working on it. A lot of my friends, also in their twenties, are in similar career situations, so there’s a mutual understanding that we can’t see each other more than twice a month. When we’re together, though, you can consider our switches fully off. It’s sad but dancing kind of burnt me out when it comes to fitness. I have to be in a very specific mood to want to work out and that mood doesn’t come around often. That said, I’m blessed to live only a few blocks from Central Park so I spend a lot of time there on the weekends, jogging or just roaming around. When I’m feeling particularly inspired, I’ll go to Broadway Dance Center for a dance class. Luam is my favourite—she’s choreographed for everyone you can imagine, including Beyoncé, and 75% of the dancers in the class are pros. I’m able to keep up but it’s a push, and I come out of there drenched. It’s a great feeling. I can’t go to ballet anymore because the muscle memory is still there but I can’t quite execute and it’s too depressing.